As pending events approach their trigger time, Power Manager will display a notification. The notification provides users with the opportunity to response to, and plan for, the pending trigger. The notification displays the event’s name and trigger time. The notification also shows a count down to the trigger time. If the user has the appropriate authorisation rights, the pending event can be adjusted, or cancelled. See the section called “Altering Pending Events”. To ensure that users are aware of pending events that could affect the Mac’s availability, Power Manager issues a range of notifications. When a notification is issued, the active user is shown a notification dialog. The dialog does not interfere with the current application, but it will be visible above all other windows. The notification dialog appears on the main display. The notification dialog is Spaces aware and remain visible even when the user switches Space. If a user logs in while the notification period is counting down, the notification dialog will appear immediately after the logging in. When a notification is issued, the Power Manager status menu’s icon changes to the pending event’s icon and a count down appears. This notification remains even if the notification dialog is closed. Power Manager’s status menu icon will become light gray when no pending event is due within the next hour. When an event becomes due within an hour, the menu’s icon will become opaque and vivid. This behaviour provides an at-a-glance insight into how far away the next pending event is. If the Login Window is visible when a notification is issued, a notification dialog is displayed on the Login Window below the authentication dialog. The Login Window notification includes the name of the pending event, the trigger time, and a count down until the trigger due. The Login Window notification is not interactive. Power Manager supports Growl for providing notifications. Growl is a free third party utility for unifying notifications across applications. Use Growl to extend how Power Manager notifies you. Growl can send e-mails, play sounds, or interact with other applications when a notification is issued. The notification period can be altered. 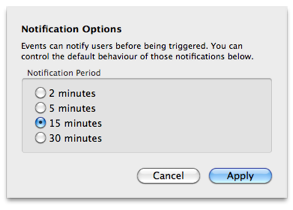 The notification period is the time before a pending trigger that users are notified. Select the menu item: Scheduler > Notification Options…. Choose the appropriate notification period. Click the Apply button ( ) to save any changes. Not all Power Manager events will display a notification. Events can be marked as quiet. If an event is marked as quiet, Power Manager will surpress any notifications it would normally issue. Some of Schedule Assistant’s workflow tasks create events that are quiet. Quiet events are useful for events that do not affect the availability of the host Mac and perform actions such as mirroring files or running scripts. Enabling this behaviour on individual events requires an alternative event creation tool, such as Power Manager Professional.